Pharmaceutical Machines are designed to hand various operations in the packaging of pharmaceutical products. Frain Industries offers a complete line of fillers for the pharmaceutical, animal health, ophthalmic, biotech and related markets. These fillers are available as stand-alone machines, equipment or as part of turnkey systems. Automatic, single lane, dual station trayer designed to handle stable containers up to 80mm diameter x 300mm high at speeds rated up to 1200 transverse displacements per hour. System utilizes a model RTE 700 rotary discharge table feeding into a star wheel indexer allowing for continuous feeding of vials and smalll bottles into a 3 sided tray. Unit completes a load sequence into the first tray section and then automatically alternates to the second station while the first station is replenished with an empty tray. Able to accept trays from minimum of 200mm x 400mm up to a maximum of 500mm x 600mm. Can handle both full and empty containers for a variety of applicatioins. Vial inspection unit. Equipped with 40" long product in feed conveyor, 6" high black rollers, 1-1/4" in diameter, on 2" centers and 1/2" gaps, inspection section, magnifying inspection glass and Halogen light with fiber-optic system. Controls for start / stop, spin rotation and conveyor and foot pedal jog control. Mounted on a all stainless steel / aluminum frame with casters. Proper change parts are required per application / vial size. Cozzoli Model BT10 automatic single lane trayer for loading containers or vials onto 3 sided tray at speeds up to 10 cycles per minute. Container size range: (1/2 to 3" dia) x height dependant upon container. Tray dimensions 11-20"width x max 36" depth. Could handle such items as vitamin and over the counter medication bottles as well as smaller vials. Seidenader Model DS10/L65, stainless steel, tablet sorter, rated up to 1000 kg of tablets per hour – depending on materials and application. Equipped with dual 23" long x 10" high x 10" slant bottom, stainless steel tablet feed hoppers with (10) 12" long vibratory tablet feed chutes to (10) hand crank adjustable sorting lanes for different channel widths for different size tablets and 28" long dual tablet transfer rollers per lane with fast lane adjustment for new tablet formats and (3) discharge chutes for too thin, too thick and good tablet thickness, capable of sorting tablet thickness down to tolerances of + / – 0.05mm. Control panel has vibratory controller with start, stop, e-stop controls. Mounted on (4) leg stainless steel base frame. Capsule cleaning and polishing machine for de-dusting, cleaning and high gloss polishing of hard gelatin capsules. Equipped with lambs wool polishing belts. Capable of up to 300,000/cph (depending on capsule size). Unit adjustable to all capsule sizes, without any additional change parts. Eisai, Model RMS-200-5, dimensional tablet sorter. Rated up to 120 kg / hr – depending on materials, application and machine configuration. Equipped with a 18" wide x 8" long x 14" deep product hopper with stepper driven lift for easy loading, (5) channel vibratory feeder, adjustable width and angle channel rollers and (3) discharge zones. Control panel with AB controller and touch pad display. Mounted on a stainless steel base frame with casters. Single or dual operator inspection belt capable of speeds up to 100,000 cph (depending on size/shape & frictional characteristics). Has automatic rotation to provide 360 degree view of all inspected products. Equipped w/ 1/2" diameter 304 S/S rollers w/ 5/8" pitch inspection conveyor. Complete with under roller light for gel cap inspection, continous feed vacuum pickup for defective products, overhead adjustable light w/saftey mirror, seperate conveyor roller motor & vibrating feeder, dust removal tray, #4 S/S contact parts. Unit mounted on casters. Single operator Inspection Belt capable of speeds up to 100,000 cph, (Depending on size/shape & frictional characteristics). Has automatic rotation to provide 360 degree view of all products being inspected. Complete with under roller light for Gel Cap inspection. Equipped w/ 1/2" diameter rollers w/ 5/8" pitch inspection conveyor, continous feed, vacuum pickup for defective products, overhead adjustable light w/saftey mirror, dust removal, seperate conveyor roller motor & vibrating feeder, #4 S/S contact parts. Caster base. Single or dual operator inspection belt capable of speeds up to 100,000 cph (depending on size/shape & frictional characteristics). Has automatic rotation to provide 360 degree view of all products being inspected. Complete with under roller light for gel cap inspection. Equipped with 1/2" diameter 304 S/S rollers with 5/8" pitch inspection conveyor, continuous feed, vacuum pick-up for defective products, overhead adjustable light w/saftey mirror, dust removal, seperate conveyor roller motor & vibrating feeder, #4 S/S contact parts. Caster base. Fully automatic, s/s, continuous motion, robotic pick & place tray loader capable of up to 20 rows of vials per minute. Vials size range: (1/2" – 2 1/2") diameter by (1 1/4" – 4")H with conventional or slotted closures. Three-sided or four-sided trays (10" – 17")W up to 26 1/2"L by up to 3"H (must be 1/8" lower than finish bottom). 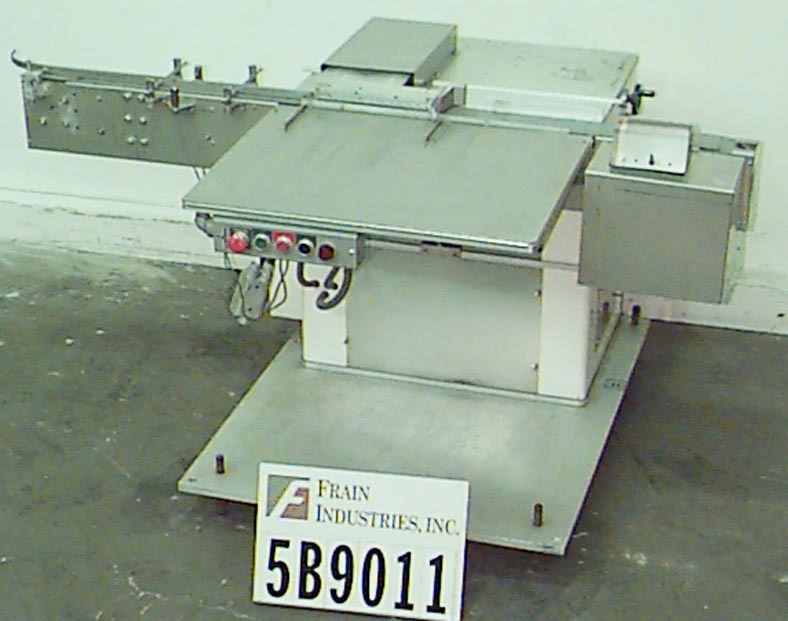 Features 152"L by 3 1/4" tabletop product conveyor, 18"L tray loading arm, two 96"L by 2"W lugged tray conveyors with 5 1/2" spacing (27" centers, 1/2" diameter lugs), 15"L by 29"W full tray transfer plate. Equipped with Omron Sysmac C200H programmable controller, push button controls LED display, E-stop, photoeyes for product presence, photoeye for tray presence, and tray backup on outfeed conveyor, Mounted on stainless steel frame. Last running 12" x 24"’ trays @ 15/min (2ml rated at 300 vials/min) for taking vials off line and traying for freeze drying. Continuous motion, robotic, pick-n-place trayloader capable of up to 20 rows per minute. (depending on size vial) Can handle (2 ml to 250 ml) vials with size range of: (0.5" – 2.7") diameter x (5.875") high (including stopper). 316 S/S construction, designed for three-sided, four-sided, bottomless, and sideless trays, up to (36"L x up to 18"W). can pack in even rows or offset rows. Features right hand infeed, no tray detection, no vial detection, starwheel infeed, overforce protection to shut down machine if vials jam up, and controls for row spacing, number of rows, and drive speed. Equipped with a (72"L x 12"W) table top belt conveyor. Mounted on a stainless steel frame with adjustable screw legs. Last running 3/4" diameter vials.